Carrie Snyder, MSN, APRN, FNP-BC, is the Women's Health Nurse Navigator. She can help answer your questions about pregnancy, labor and delivery at Beebe, classes offered at Beebe, surgery options, and more. She can also discuss health and wellness topics, as well as help you locate the appropriate doctor or healthcare provider. To reach Carrie on the Women’s Health Navigator line, call TOLL-FREE (844) 316-3330 or email womenshealth@beebehealthcare.org. 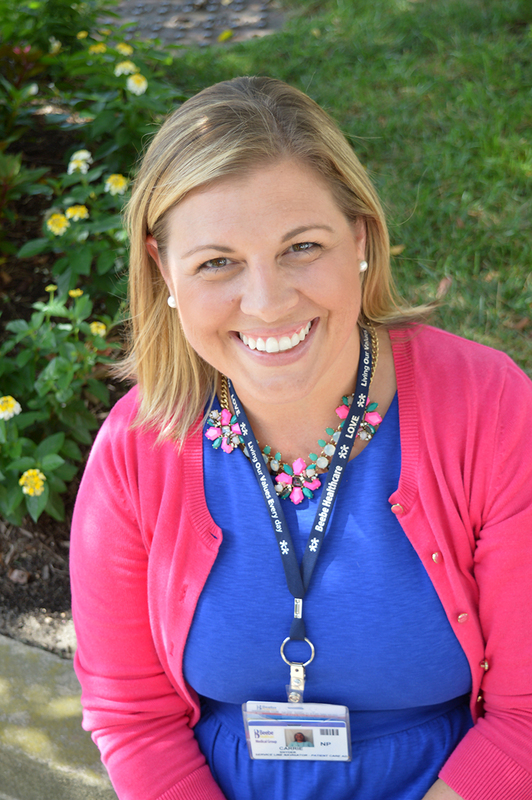 Carrie started her nursing career as a Registered Nurse in the Intensive Care Unit at Beebe in 2004 after graduating with her nursing degree from the University of Delaware. She earned her Masters of Science degree in Nursing from Wilmington University in 2008 and was board certified by the American Nurses Credentialing Center (ANCC) as a Family Nurse Practitioner. At that time, she began working as a Family Nurse Practitioner at Beacon Family Practice and Beacon Pediatrics providing primary care for adult and pediatric patients. She returned to Beacon Family Practice with Beebe Medical Group in 2015 after spending time working in Walk-In Care. She has worked as the Family Nurse Practitioner and Coordinator of Laurel High School Wellness Center and served on the action committee for Delaware Adolescent Program, Inc. (DAPI) in Sussex County. She has also served as adjunct faculty at Wilmington University in the Family Nurse Practitioner Program. Carrie grew up in Sussex County and now resides in Millsboro with her husband and two “Beebe Babies,” ages 3 and 5. Call Carrie on the Women’s Health Navigator line TOLL-FREE at (844) 316-3330 or email womenshealth@beebehealthcare.org.